Motherhood changes a lot of things – and according to a newstudy from Merry Maids, the nation's largest home cleaning provider and a ServiceMaster (NYSE: SERV) company, that includes moms' definition of a clean home. This Mother's Day, Merry Maids is helping families step up their game to give Mom the pristine-looking home she desires. According to the findings, 70 percent of moms surveyed say their definition of a clean home is less stringent since having kids. While being a mom brings joy, it also means constant messes and less free time, which naturally causes priorities to shift. And since most moms (81 percent) claim responsibility for keeping the home clean, the everyday cleanliness of the home can take a back seat. "The best Mother's Day gifts aren't always the ones that come wrapped in a bow, but the ones you can see, feel and experience," says Debra Johnson, Merry Maids home cleaning expert. "For Mother's Day this year, take back the responsibility of cleaning and impress Mom by getting every nook and cranny of the home, or her favorite space, as clean as possible." To help families plan for Mother's Day, Johnson shares a few tips and creative gift ideas, as well as fun ways to get the kids involved in cleaning without it seeming like a chore. After you serve Mom breakfast in bed, get to work on the following tasks. Focus on the simple things first. Start with the everyday tasks you know Mom would likely love a break from. Make sure the toys are picked up, the laundry is put away and the grocery shopping is done. Take it a step further by coming up with organizational systems along the way to keep the family on track, such as an easy in/out paperwork system for mail, creating laundry bins for each family member or designating "homes" for each type of toy. Gift card idea: meal delivery service. Frame the kids' artwork. These precious masterpieces can clog up drawers, tables and other areas of the home. Pick out your favorite ones and frame them for Mom to showcase. For the remaining pieces, compile them into scrapbooks that Mom can save. Even more left over? Organize the ones you know mom won't want to part with and photograph or scan the others to save electronically. There are even apps that can help with this process. Gift card idea: local scrapbooking or frame shop. Make cleaning for mom a game for the kids. Have a sock pairing contest with the kids orsee who can put away everything in their rooms first. While they're busy doing that, Dad can tackle the dirty laundry and bathrooms and Mom can enjoy some well-deserved relaxation. Gift card idea: spa treatment or manicure. Hire the professionals. 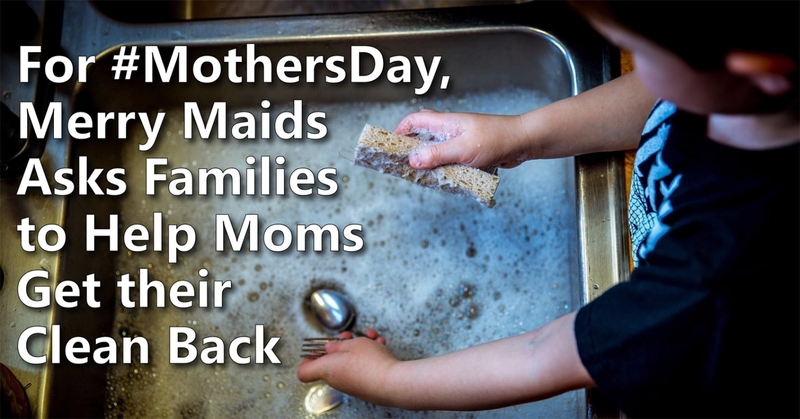 Once your work is done on Mother's Day, go the extra mile to surprise Mom by calling in the professionals at Merry Maids to take over the deep cleaning year-round. This is extra special for a new mom who is likely getting little sleep and cleaning is the last thing on her mind. If distance is keeping you from celebrating with your mom in person, a Merry Maids gift card makes for the perfect gift, as it can be redeemed at her convenience. Gift card idea: Merry Maids gift card. To purchase a gift card or find the nearest Merry Maids location, visit MerryMaids.com. Merry Maids can customize a cleaning plan for your home, ensuring a consistent, reliable and thorough cleaning every time. Merry Maids is the largest home cleaning franchise network in the United States. Merry Maids provides services in 48 states and the District of Columbia through approximately 370 company-owned locations and franchised outlets. The company also provides home cleaning services in Canada, Ireland and the United Kingdom and has licensing arrangements whereby licensees provide these services in Hong Kong, Japan, South America, South Korea, Southeast Asia and Australia. Through its company-owned and franchise locations, Merry Maids employs more than 8,000 home cleaning professionals who service homes on four continents, including more than 200,000 homes in North America every month. Merry Maids is a business unit of ServiceMaster Global Holdings, Inc. (NYSE: SERV), a leading provider of essential residential and commercial services.